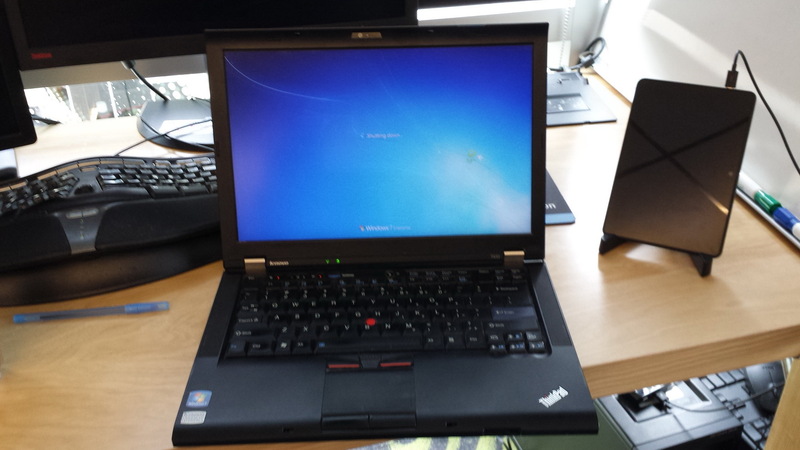 At the end of last week, I turned in my old 3.5 year-old work laptop, my rugged, trusted Lenovo ThinkPad T410. My old Lenovo ThinkPad T410 work laptop. When I started using it at work, I didn’t like it. I was using the MacBook Pro I had purchased to help me finish my dissertation. Windows seemed very pedestrian. The Ctrl and Alt keys were in the wrong place. There was no Unix-like command line (at least not by default). Obviously, in the last three years I have adapted. One of the nice things was the docking station that came with the Lenovo. It was easy to plug in mouse, keyboard, speakers, Ethernet, and two monitors. In my work environment, actually developing on Windows would probably be hard, though. So now I have a Mac again (in addition to my own dissertation MacBook Pro at home). 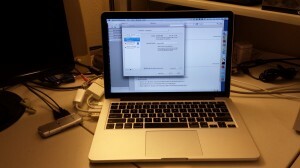 My new MacBook Pro work laptop. I spent the last weekend setting it up so I could work with it today without interruption. What have I learned? The keys are all in the wrong places. That’s particularly true when I type on my Microsoft Natural Ergonomic Keyboard 4000. I use either a KVM switch or Synergy to control multiple computers with one keyboard and one mouse. At home, I have a Windows 7 desktop, so everything on my keyboard works as expected. At work, I now have an Ubuntu box, so Ctrl/Win/Alt on my keyboard are Ctrl/Super/Alt, also pretty much as expected. Except when I move over to the Mac, then Ctrl/Win/Alt is Ctrl/Alt/Command. Copying on the Mac, for example, is done using Command-C, but now it feels like I’m tying Alt-C. Should I remap that so Ctrl is Command? But then where does Ctrl go? Furthermore, I have noticed how bad Office is on the Mac. Especially Outlook and Communicator. Oh, and OneNote, of course, which doesn’t exist at all. What do I use now to take notes? And in Communicator, I now can’t schedule conference calls anymore. And Outlook isn’t able to show my personal Google Calendar anymore, so I’ll have to be more careful about work running late and interfering with other activities. I’m missing the docking stations. It’s a bit of a mess to plug in power, a Thunderbolt cable with an adapter to Ethernet, a Thunderbolt cable with an adapter to a monitor, and a USB cable to a USB hub, which connects to keyboard and mouse. Apple changed the MagSafe power connector, so none of my power adapters at home fit, and I need to use MagSafe-to-MagSafe2 adapters for the power adapter as well. Ugh. Why, Apple? I’ll probably try a HengeDock again. I’ve tried a HengeDock in the past, and it broke, but they’re coming out with metal versions. On the other hand, the MacBook Pro is much faster, has a much better display, is much lighter, and has much better battery life. And I can actually develop on this laptop. 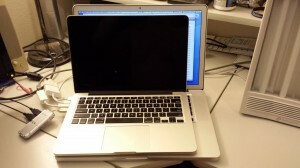 In terms of size, I like it better than my own MacBook Pro. The 15″ MacBook Pro is too big to comfortably work on airplanes, for example. My old 13″ white MacBook fit much better. 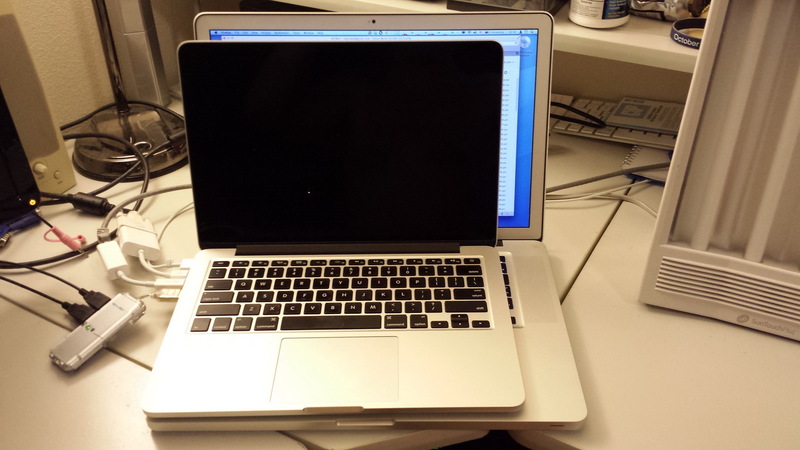 13″ MacBook Pro for work on top, my own 15″ dissertation MacBook Pro on the bottom. So, what can I expect from this laptop? I’ll get used to it, and I’ll like it. That’s what.